Oh the life of a blogger. So I'm in the middle of my Shellac experience (day 15!) on my right hand, and I'm trying to play with my Layla Magnetic polishes, and then on my left hand I have some Jesse's Girl both in a water marble (!) and one neon thumb. I just smile when someone notices and kind of shrug my shoulders. Coming up on PolishGalore, I have the fall collections from Dr.'s REMEDY, Color Club, OPI, & Zoya, my first NUBARs, both LCN and Layla entire line of magnetic polishes, No-Miss Ltd, and more China Glaze goodies from Cosmoprof! Thank you all for reading! Sometimes I go out with non matching hands too! Nice marble! Can't wait to see what you have in store. You know...who says all ten nails have to be the same? I like your idea. 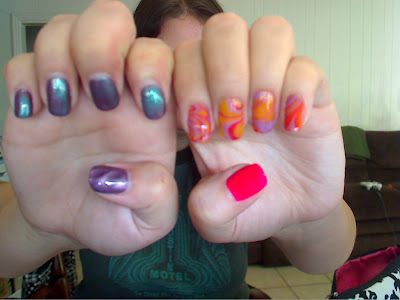 :) The marbling has cool shades too.